This entry was posted on Wednesday, February 26th, 2014 at 5:59 pm	and tagged with crime, dark humor, death, detective, fairy tale, fiction, flash fiction, Friday Fictioneers, funny, hair, murder, quirky, Rapunzel and posted in Friday Fictioneers. You can follow any responses to this entry through the RSS 2.0 feed. Thank you. 🙂 I like dark humour. Now that’s a unique take on the prompt. I will be chuckling over this one all day. Thanks for starting my day with laughter. Love it. 🙂 Loved the voice in this. Great take on the prompt too. Ha! Very funny! I’ll never look at hay bales the same again. 🙂 Farmers: the biggest barbers in the world. Ha ha ha, she obviously never heard of conditioners!! 😆 Great take David. Very entertaining David. I love your humour as usual, still smiling at this take on the prompt. This was great. Not quite what I was expecting from the title, better than what I was expecting. Well done. Wow Bjorn, that’s some high praise. 🙂 I appreciate it. Glad you liked it. Really funny story! Very creative use of the prompt. That was very amusing. Very well done. sell it to wig factory, it will be worth lot of money! loved the story! its hilarious! You are a killer writer David and it’s time you hire an agent…just a pair of scissors won’t do! Thank you and I agree I do need an agent. I’m just about to start the search actually. Here’s hoping. Ha ha! Clever take, David. Rapunzel went mad! That hair was just weighing her down too much. Terribly clever, Dave! Maybe you and Linda could put together an entire collection of these twisted takes on popular fairy tales? Nice work! Ah! More twisted fairy tales! Loved it, darling. The title is so awesome there’s no way the story could live up to it right? Wrong! Hilarious through and through! The Grimm’s brother’s forgot to mention her homicidal nature. Glad you’ve revealed it!! Brilliant! I saw hay, you saw a gazillion feet of hair. I’ll take the hair, dye it and use it. Another excellent dark and intriguing tale! Rapunzel, Rapunzel, let down your machete! Fairy Tale gone wrong, brilliant. I love how you took bales on a trailer and turned them into bails of Rapunzel’s hair. Have you seen the Pixar Repunzel? I can just picture her singing that magic hair song as she strangles people. Yeah, I liked that movie. She was too sweet to hurt anyone though. Love your take on the prompt! I can relate to the hair thing driving you mad. Too many bad hair days can send you over the edge. How are you at knitting? 🙂 Neat take on the prompt, David! I enjoyed it. A lovely, surprising take. Full of gentle twists. Great. So – they’re bales of flax then? Great and funny take on the prompt. That you looked at the hay wagon and saw bales of hair is funny enough! That said, it’s given me an idea. You took a folk tale and got a plot for a story from it. You could get plots from any folk or fairy tale. This is already being done, but it doesn’t matter, because there are endless such tales and endless possibilities of plots … I have a collection of tales from all round the world. Now I know what to do with them. Thank you! Whoa! I did not see that coming. Who would have thought of straw as hair ! Brilliant! Wonderful piece – you are so talented! Funny, funny – poisoned tooth comb. This was a great read! Oh, this is priceless. The best fresh look at an old fairy tale I’ve seen in years and years. So good. This is such an I original idea. 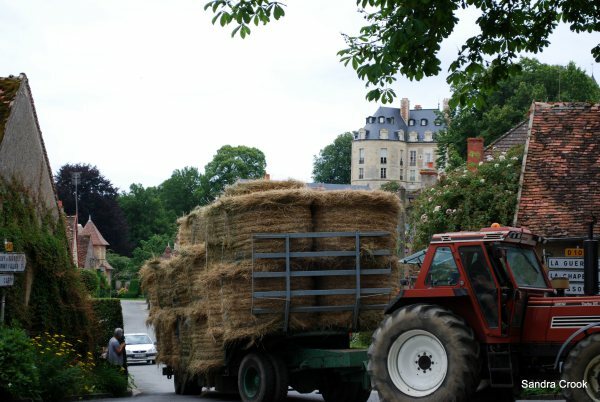 Now those 30 bales… Hollywood must get through a lot of wigs. I’m sure they could use a lot. 🙂 I originally wrote “4 bales” but then I looked at the picture again and changed it.